Genea-Musings: Amanuensis Monday - 1824 Deed of Samuel Stone Jr. to Zachariah Hildreth in Townsend, Mass. 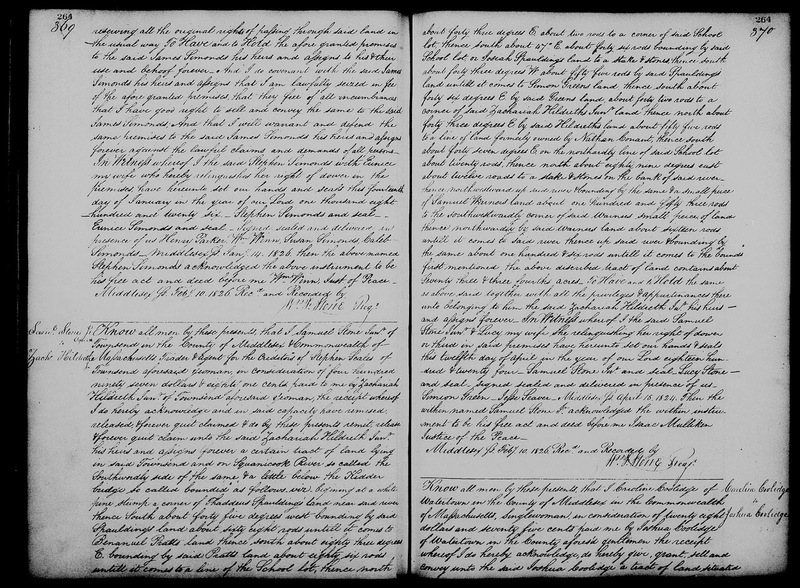 Amanuensis Monday - 1824 Deed of Samuel Stone Jr. to Zachariah Hildreth in Townsend, Mass. about twelve rods to a stake and stones in a line of said Greens land. forty four rods to a stake and stones by the road leading to said Dix's. April in the year of our Lord eighteen hundred and twenty four. dlesex ss. Oct. 4th 1824. Then the above named Samuel Stone Jr.
before me Nathaniel Cummings Just. of Peace. 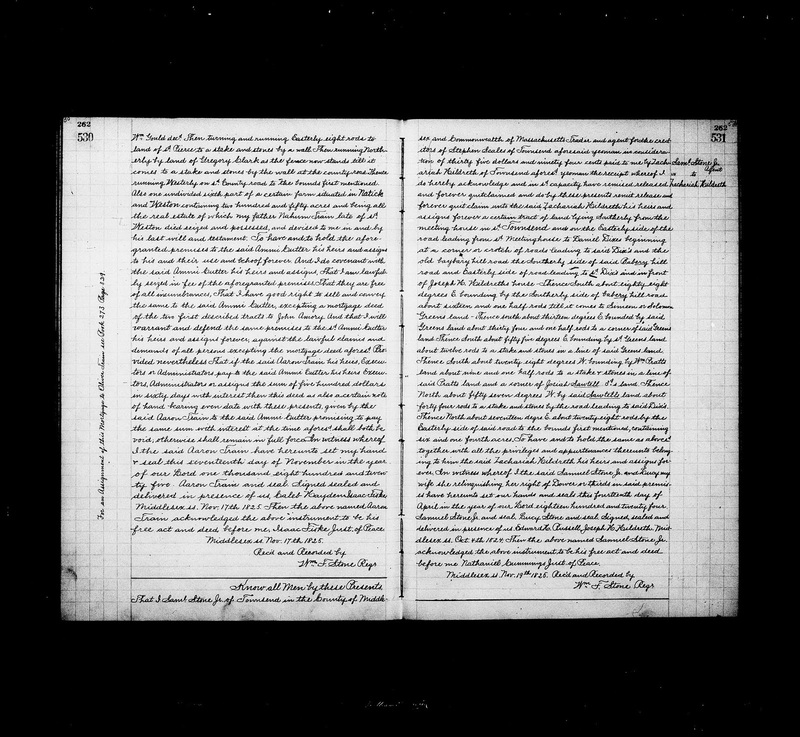 "Massachusetts, Land Records, 1620-1986," digital images, Church of Jesus Christ of Latter-Day Saints,FamilySearch (https://familysearch.org : accessed 4 November 2018), Middlesex County, "Deeds, 1825, Vols. 260-262," Volume 262, pages 530-531 (image 822 of 835), Deed of Samuel Stone Jr. to Zachariah Hildreth, executed 14 April 1824, recorded 19 November 1825. It is unclear if the grantee is Zachariah Hildreth Sr. (1754-1828), who has been called "Gentleman" in earlier deeds) or Zachariah Hildreth Jr (1783-1857), who has always been called "yeoman" in earlier deeds. This same Samuel Stone Jr., acting as an agent for the creditors of Stephen Scales, sold Zachariah Hildreth Jr., yeoman of Townsend, another tract of land in Townsend on 12 April 1824. Perhaps a later deed will be found that sells this land and identifies which Zachariah was the grantee in this deed. I noted that this tract of land is a neighbor of land belonging to Josiah Sawtell the 3rd, who is either the father or brother of Hannah Sawtell, who married Zachariah Hildreth Jr. in 1810.